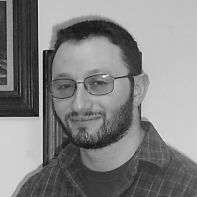 Yosef Rosen is completing his M.F.A. in poetry at Bowling Green State University, and serves as Assistant Poetry Editor for Mid-American Review. His poems are published in Slipstream, The Chariton Review, Blue Monday Review, Gloom Cupboard, and Maudlin House, and forthcoming in Common Ground Review. Although he currently resides in the Black Swamp of Northwest Ohio, his heart and liver belong to St. Louis, and he can be found there during summers and occasional breaks. the cool tunneling of time. promise to safeguard within reach. Too full of piercing. in frowning, a shrink from awkward gaze. an elephant gone mad with rust. with which to churn the earth. and tainted water, the colorless death within.